Chronic pain affects nearly 100 million Americans. Ongoing fatigue affects even more. The combination of fatigue and body-wide chronic pain, often called “fibromyalgia,” remains mysterious and confusing, and an alarming 66 percent of sufferers are misdiagnosed. Now, leading naturopathic medical doctor and nutritionist David Brady is here with the answer in his comprehensive book The Fibro Fix. For more than 23 years, Dr. Brady has treated many thousands of patients seeking relief from fibromyalgia. In The Fibro Fix, he distills his life-changing prescription into an integrative 21-day program to help you determine if, in fact, you’re suffering from fibromyalgia or from one of several severe symptoms misdiagnosed as fibromyalgia. The plan begins with three simple steps—detox, diet, and movement—to start relieving those symptoms for good and then offers deeper long-term solutions specific to the real cause in each person. The Fibro Fix is your groundbreaking guide to resolving fibromyalgia, and uncovering the mystery behind chronic pain and fatigue. Dr. David M. Brady, is a leading naturopathic medical doctor at Whole Body Medicine in Fairfield, Connecticut. He is the VP of Health Sciences and the director of the Human Nutrition Institute at the University of Bridgeport and the chief medical officer of Designs for Health, Inc., and Diagnostic Solutions Laboratory, LLC. Dr. Brady is a highly sought after presenter and prolific author of medical papers and research articles on fibromyalgia as well as a dedicated champion and advocate for patients suffering with a fibromyalgia diagnosis. Learn more at DrDavidBrady.com and FibroFix.com. "Dr. David Brady approaches the topic of fibromyalgia care with knowledge that is both broad and deep; careful consideration of evidence; a fierce commitment to helping patients; a bounty of compassion; and a holistic perspective. His approach is as full of empowerment and hope as it is well informed by science. Guidance in this challenging area doesn't come any better than this." —David L. Katz, MD, MPH, Director, Yale University’s Prevention Research Center, bestselling author of Disease Proof and The Flavor Point Diet. —JJ Virgin CNS, CHFS, Celebrity Nutrition & Fitness Expert, bestselling author of The Virgin Diet and The Sugar Impact Diet. —David Perlmutter, MD, Author, #1 New York Times Bestseller, Grain Brain and Brain Maker. 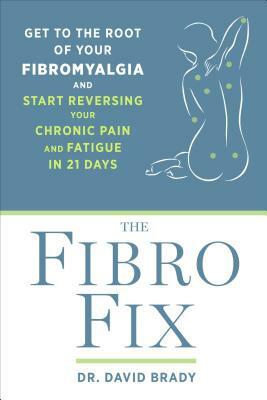 "The Fibro Fix is game-changer and must read for the millions of chronically ill patients who suffer from fibromyalgia and are failing under the conventional medical approach. Dr. Brady’s program integrates the best of basic and clinical science through a cutting-edge functional medicine approach. Dr. David Brady is an internationally renowned expert in fibromyalgia, master nutritionist, scholar of natural medicine, Vice President of Health Sciences at the University of Bridgeport and compassionate healer. He has provided fibromyalgia patients’ a home run." —Gerard E. Mullin MD, Associate Professor of Medicine-The Johns Hopkins University School of Medicine-Author of The Gut Balance Revolution: Restore Your Boost Your Metabolism and Lose the Weight for Good. —Susan S. Blum, MD, MPH, Author of The Immune System Recovery Plan, Founder and Director, Blum Center for Health. —Alan Christianson, NMD, NY Times bestselling author of The Adrenal Reset Diet. "If you have fibromyalgia, chances are you have been misdiagnosed and misinformed at some point in your journey and are still suffering needlessly. With The Fibro-Fix, help is here at last! Dr. David Brady unravels the puzzle of fibromyalgia with a comprehensive, individualized, and root cause approach that can help you eliminate your pain and recover your health!"